Lovely 2 bedroom 1 bath condo sleeps up to 4 people, has a full kitchen and small yard. 760 sq. ft. of living space, it is centrally located close to University of Arizona, downtown and much more. Quiet neighborhood, walk to park and bus lines. Laundry room and pool on site, covered gated parking, peaceful setting. Convenient to bus lines and bike paths. A truly lovely place to stay in Tucson!!! We are a family of 3 former Tucsonans who bought our property the year our son was born so we would always have a place to come back to in one of our favorite cities! Though we are California residents now, Tucson remains our second home. We hope you will consider our condo as your home away from home! Our condo location is so convenient to everything we love to do in Tucson. Close to the University and downtown, we find that most of our needs are within a 15 minute drive, and within 30 minutes we can be in the mountains hiking. It is truly a great location no matter what you may be interested in doing in town. Our condo complex is small and private, quiet enough to feel like a relaxing getaway, yet close to all the amenities of a city. We love our place and think you will too! We love that La Madera Park is just a 2 block walk from the property, making it particularly appealing for our guests with dogs! All necessary sheets, blankets and pillows provided. On site coin op washing machine just down the path from your front door. Our fully stocked kitchen has all the basic needs, including but not limited to a microwave oven, blender, cooking pots and pans, coffee maker, toaster. expandable kitchen table seats up to 4. Modern flat screen tv in living room. Gated communal pool on premises. 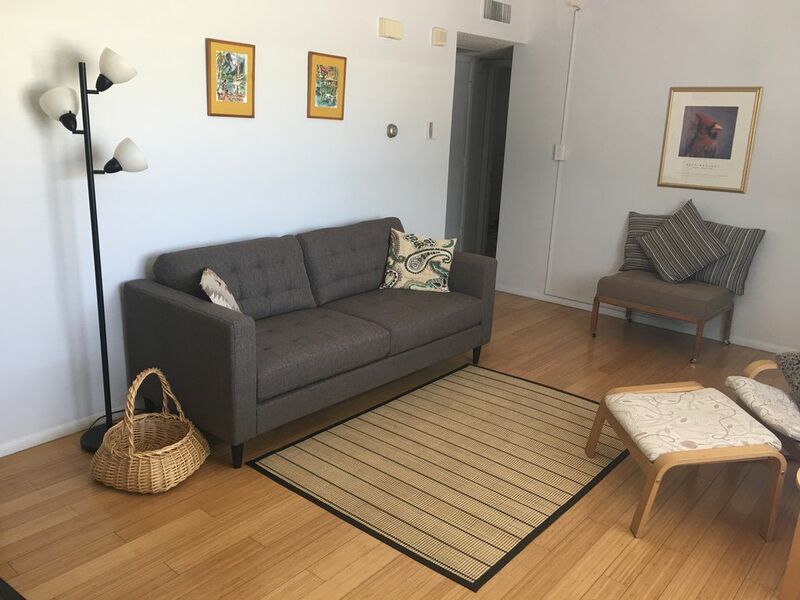 Our lovely little condominium in central Tucson is a great jumping off point to all your Tucson area destinations! Convenient location in a quiet and comfortable setting. We supply dishes and pots and pans as well as all linens and towels. Conveniently located just a few miles from the University of Arizona and Downtown Tucson, our location is perfect for all of your in town activities. Centrally located, we are also short drives (30-40 minutes) from Saguaro National Monuments East and West, as well as Mt. Lemmon Highway, Davis Monthan Air Force Base and the Tucson International Airport. No smoking, pets must be taken off site for bathroom breaks, no pets in communal grassy area. Children may not be left unattended in communal area.